THIS ARTICLE CONTAINS THE STATS, STRATEGY, AND GUIDE FOR CASTER - WOLFGANG AMADEUS MOZART. WE WILL UPDATE THIS AS SOON AS THE GAME COMES OUT. 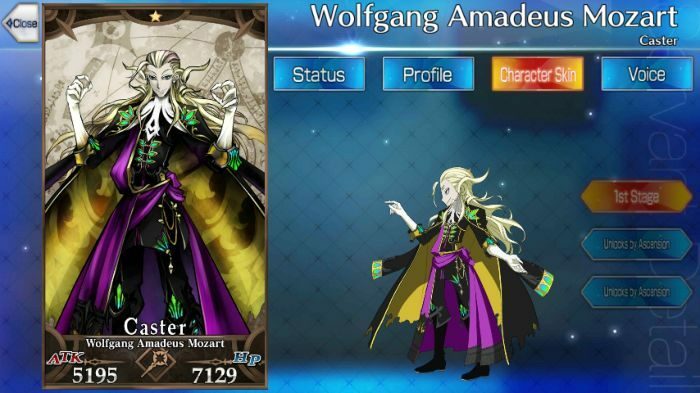 This article contains the stats, strategy, skills, and abilities of Wolfgang Amadeus Mozart from Fate Grand Order [ FGO]. Due to his multiple Arts Cards and his high propensity to draw them, Wolfgang Amadeus Mozart can quickly charge his Noble Phantasm. If his Protection of Muse (Fake) is cast, he has a higher damage output for his Arts Cards along with higher NP gain for every Arts card used. He works well as one of the few servants that can decrease the incoming damage of an enemy’s Noble Phantasm. Gaius Julius Caesar – His ability to cast Charisma and Tactics will allow a player to sustain Wolfgang Amadeus Mozart. It also allows Mozart to be more versatile in battle and to increase the frequency of his Noble Phantasm. He can also decrease the defenses of his enemies which allows Mozart to also stack with his Noble Phantasm. Vlad III – Vlad III is similar to Mozart in having a high propensity to drawing out Arts cards. Thus, this may dramatically increase the incoming amount of NP charge which will allow the player to synergize both Mozart’s Noble Phantasm and Vlad III‘s. Orion – As one of the five star Archer class servants, Orion also relies heavily on her noble phantasm. In this case, Mozart can support by casting Protection of the Muse (Fake) to increase the charge of her Noble Phantasm. Cuchulainn – Due to Cuchulainn‘s reliance on Critical Damage, Mozart can support by adding more critical stars. If Cuchulainn is using the Rin’s Pendant Build, his damage becomes even more consistent due to Mozart’s additional Critical Stars from Little Night Music. Paired with his active skill “Protection of Muse (Fake)”, this card can stack its effects and increase his NP gauge charge dramatically. This is also included with his innate passive ability – Territory Creation. This allows him to quickly spam his Noble Phantasm, Requiem of Death. Because of this, the enemy will suffer a constant ATK/DEF decrease and Curse Status Ailment. Similar to Sorcery Ore, the increase coming from it is much higher. Thus, the frequency of casting his noble phantasm increases. This combination works well also with Vlad III who relies heavily on Arts cards. The Battle of Camlann instantly charges his Noble Phantasm (NP) which allows him to deploy Requiem of Death immediately. In doing so, this can immediately secure the momentum of battle in your favour in terms of damage output coming from your servants. A cheaper version of Battle of Camlann which gives his NP gauge a 30% upstart. Due to its lower cost, this will also allow you to station stronger servants should Amadeus die first. If you’re looking for Mozart’s Interlude Quest, click here. Protection of the Muse (False) EX 1 7 Increases party’s Arts card performance for 1 turn. Aesthetic Appreciation B 1 7 Reduces the damage of one enemy servant’s NP for 1 turn. Random chance to decrease ATK/DEF and inflict Curse for 3 turns each. Each debuff increases in effect. Wolfgang Amadeus Mozart is a famous figure during the Classical era who is known as a brilliant and influential composer of several pieces of music. He has composed several concertos, operas, symphonies, and portions of the Requiem which are still being played today due to its timeless complexity. Mozart has only been one of the pioneers of the classical music genre, which is still considered as one of the best genres in music.